The most famous address in the United States is 1600 Pennsylvania Avenue, Washington, D.C. The White House is where the President of the United States lives and works. The flag always flies from the rooftop when the President is at home. Click a picture below to go to the large printable White House coloring pages and pictures. For two hundred years, the White House has stood as a symbol of the Presidency, the United States government, and the American people. Its history, and the history of the nation's capital, began when President George Washington signed an Act of Congress in December of 1790 declaring that the federal government would reside in a district "not exceeding ten miles square on the river Potomac." President Washington, together with city planner Pierre L'Enfant, chose the site for the new residence, which is now 1600 Pennsylvania Avenue. As preparations began for the new federal city, a competition was held to find a builder of the "President's House." Nine proposals were submitted, and Irish-born architect James Hoban won a gold medal for his practical and handsome design.  There are 132 rooms, 35 bathrooms, and 6 levels in the Residence. There are also 412 doors, 147 windows, 28 fireplaces, 8 staircases, and 3 elevators.  At various times in history, the White House has been known as the "President's Palace," the "President's House," and the "Executive Mansion." President Theodore Roosevelt officially gave the White House its current name in 1901.  Presidential Firsts while in office... President James Polk (1845-49) was the first President to have his photograph taken... President Theodore Roosevelt (1901-09) was not only the first President to ride in an automobile, but also the first President to travel outside the country when he visited Panama... President Franklin Roosevelt (1933-45) was the first President to ride in an airplane.  With five full-time chefs, the White House kitchen is able to serve dinner to as many as 140 guests and hors d'oeuvres to more than 1,000.  The White House requires 570 gallons of paint to cover its outside surface.  For recreation, the White House has a variety of facilities available to its residents, including a tennis court, jogging track, swimming pool, movie theater, and bowling lane. 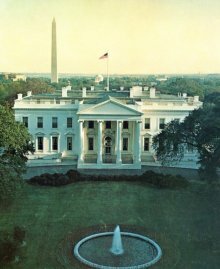 For many years the President's office was located in his living quarters, the second floor of the White House. When Theodore Roosevelt brought his large family to the White House in 1901, he felt that his office and home should be completely separate. Two wings or extensions were added to the first floor. The President's Office was then moved into what is now called the "West Wing." White House coloring pages are fun, but they also help kids develop many important skills. These skills, eye-hand coordination, color concepts, picture comprehension, form the foundation for early learning success. Kids who color generally acquire and use knowledge more efficiently and effectively. Enjoy these free, printable White House coloring pages! Our White House coloring pages and pictures may be used only for your personal, non-commercial use. Parents, teachers, churches and recognized nonprofit organizations may print or copy multiple coloring pages or pictures for use at home or in the classroom.